I’ve blogged about wedding dresses, bridesmaids, colour schemes and themes…. but I haven’t really talked much about decor. This is definitely one area I under-budgeted for initially. The best tricks are to buy used items from thrift stores and from Craigslist; to DIY with paper, felt, streamers, fabric, etc; and to keep it simple. Easier said than done, because it’s fun to let your imagination run wild! Since beach weddings are uber popular, and also because my own decor theme is ocean-inspired, this blog is dedicated to decorating ideas for seaside weddings. In most cases, if you click on the image it will link to the vendor. Please note: I am not in any way associated with these sellers. 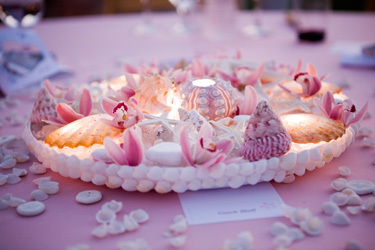 Ocean-inspired wedding decor: Seashells and starfish. There are so many ways to use them! They are easy to scatter around tables, display in vases or bowls, and instantly create the seaside mood. Michael’s craft store carries a starfish garland, or you can make your own. 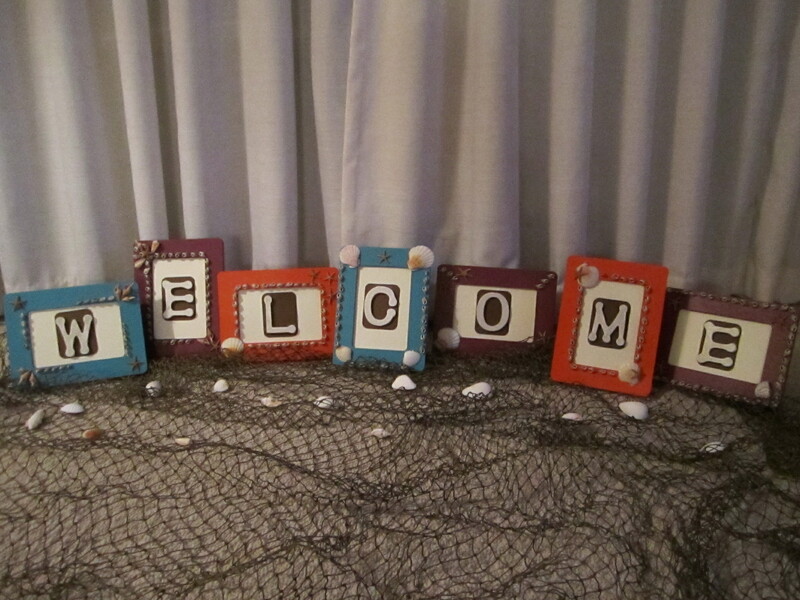 These are the seashell-decorated frames that my partner and I made. 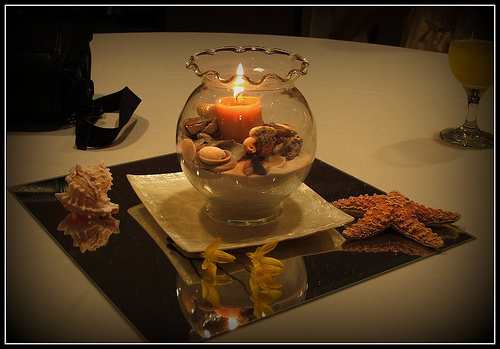 Beachy centerpieces: Fill fishbowl vases half with sand, add a few shells, stick in a pillar candle, place on a square mirror et voila! I love these! The pink orchids are so tropical, and match the pink in the shells. LED tealights were used to make the centerpiece glow. Beach wedding favours: These lighthouse tealight holders are cute, aren’t they? Could be used in decor and double as a favour. These sailboat tealight holders are nice. 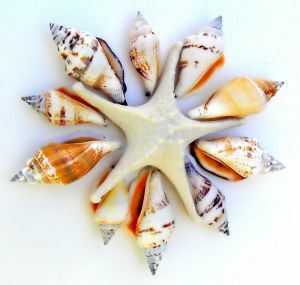 I like these as well- sand and seashells. Or, starfish wine bottle stoppers make a practical (and pretty!) gift. Don’t forget your bridal accessories: A lovely rhinestone clam shell necklace. … or white pearl starfish for more glamour. 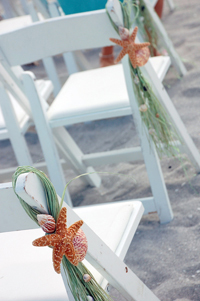 Aisle decor: Starfish attached with seashells to green sea grass. Tropical flowers and petals are colourful and biodegradable. 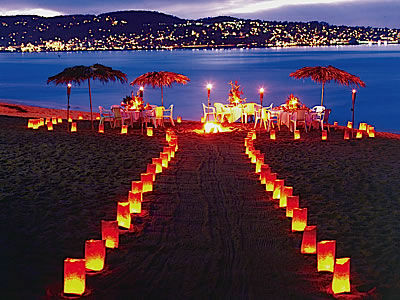 Illuminaires are a great choice for a beach wedding at night since they are visually stunning, practical (they provide light and direction), and easy to DIY too! It’s no wonder why beach and destination weddings are hugely popular. 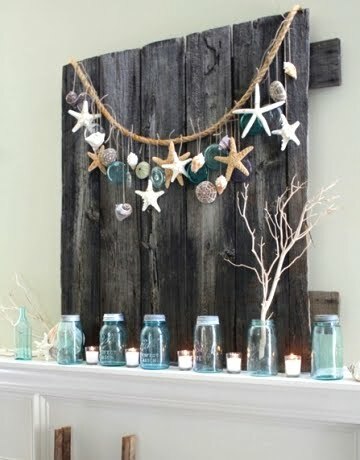 Even if you aren’t getting married on an actual beach (like me- I’ll be on a boat), it can be fun to incorporate starfish and seashells into your decor theme; although I must say I think it makes the most sense if you are close to water at least. 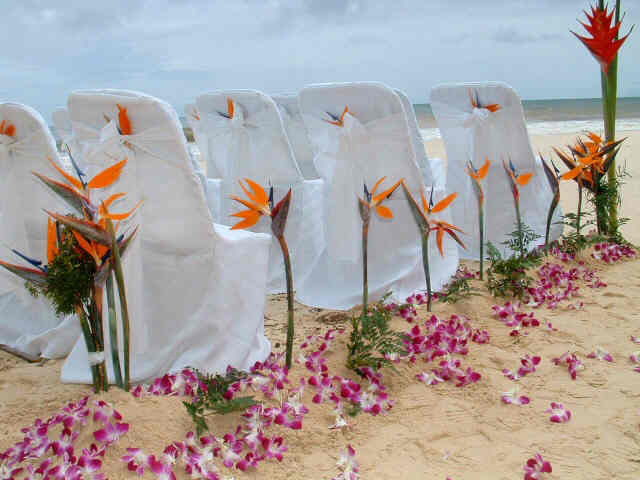 Of course, brides will be brides, so who’s to stop a prairie wedding from having a beach theme? Lol! 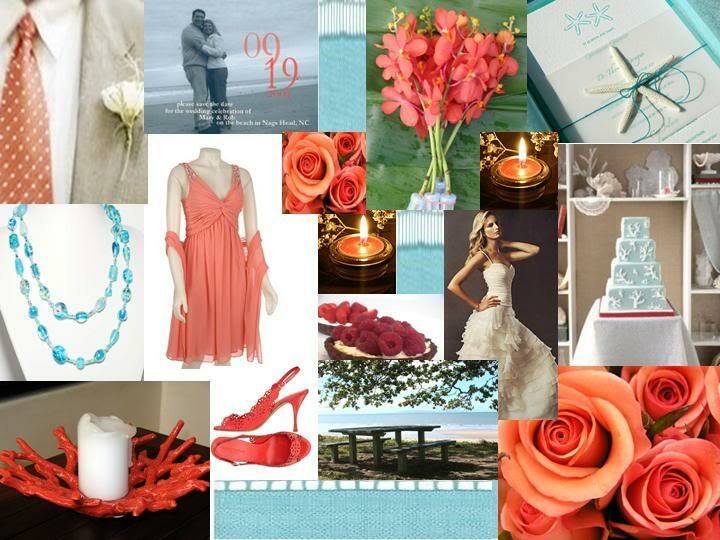 Are you have a beach wedding, or an ocean-inspired theme? Choosing our wedding colours was not a simple decision that we made early on and never changed our minds. Before I got engaged I didn’t even know you had to choose wedding colours! And I had never heard about weddings having themes. Maybe I’ve only been to traditional weddings. Or I didn’t notice. We have changed our colours quite a few times. 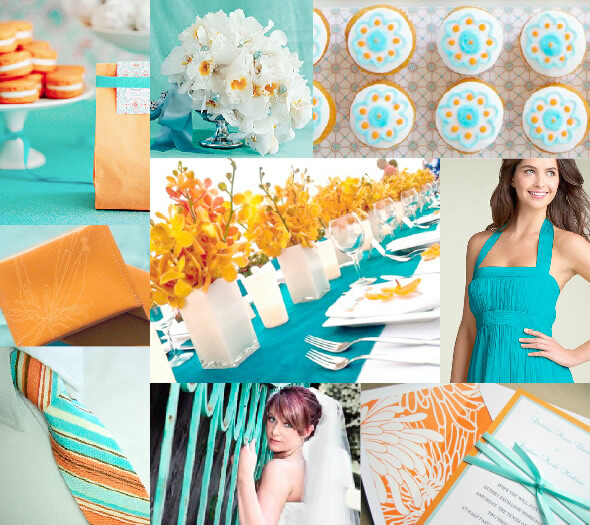 Our first choice, Mango Orange and Aqua Blue, was the result of us trying to play up the “beach” theme. Our venue is a big ferry boat docked on the ocean, but we are not on a beach. A girl can dream, no? After I was informed by one of my bridesmaids that she refuses to wear blue, we switched to Persimmon and Plum. 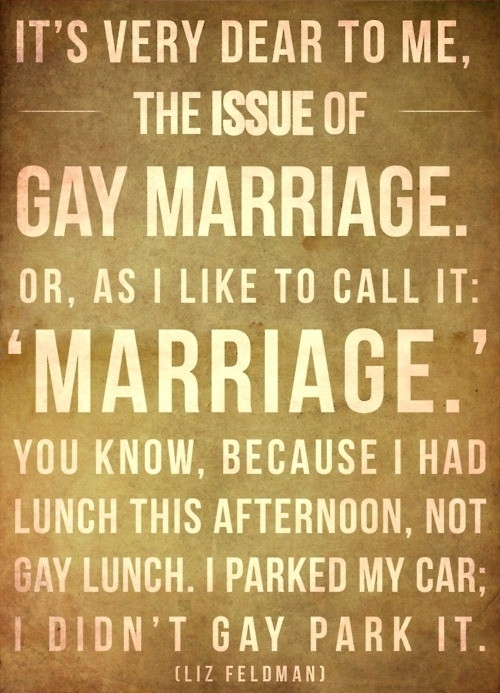 That’s wedding-speak for orange and purple. It was less “beachy” and more “tropical” and I thought I could live with that. I was having a hard time letting go of the aqua blue however, because we had already started down the path of the seashell theme in some of our decor DIY, and it seemed an obvious match. ‘Enchanted Summer Evening’ in Blue, Green, Purple and Pink. We chose to get married on August 1st since it’s the midsummer full moon; an auspicious and magical night to celebrate our love. These colours fit perfectly with our desire to have an earthy, whimsical aesthetic with our decor, since we are creating a Celtic-inspired ceremony with our Reverend. Also, the seashell decor won’t be entirely out of place since we are, as I mentioned, right on the ocean. One of the most stressful parts of planning this wedding has been deciding the wedding party attire! When you are too definitive (THIS exact dress, in THIS exact colour) you come off as controlling, bossy, and (gasp!) a bridezilla. When you’re too sensitive to everyone’s feelings and try to please everybody, you usually end up not pleasing yourself. At last we have discovered our saving grace. Co-ordinated mismatched! I think it’s a new trend, and for good reason. We’ve decided to take ONE of our colours, purple, and have them in varying shades. Once my girls decide on their dresses, then my fiancée will match the shades for the ties on her butch-maids. So she gets her colour-coordination (with variety) and my bridesmaids get more freedom in choosing the dresses. Happy Happy. This is one wedding trend that I hope is here to stay. Here’s some of our inspiration pics. If you want to see more examples of coordinated mismatched wedding parties, and even some completely mismatched, I started a dedicated Pinterest board on the subject. Check it out. So I’ve been seeing that my blog gets a lot of hits from people looking for beach wedding colour schemes, so I thought I’d elaborate on the subject. Not that I am an expert, by any means! 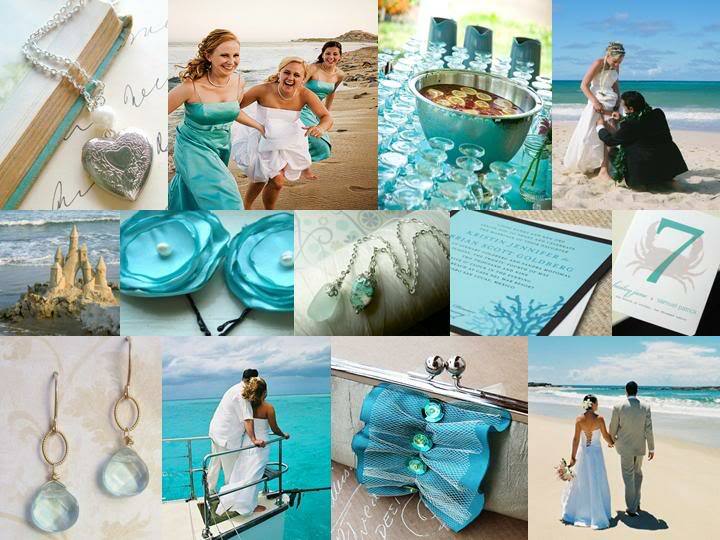 When you are getting married by the sea, blue seems an obvious choice. Alas, there are many variations on the hue of blue, so it can be hard to colour-coordinate. Marine blue? Teal or turquoise? Pool blue, aka Tiffany blue? 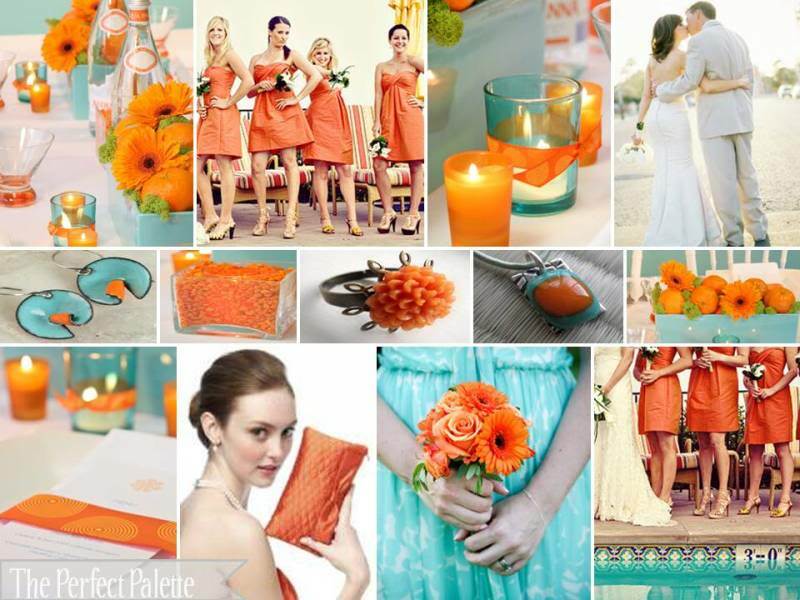 Early on, I came across a fabulous blog dedicated to wedding colours called The Perfect Palette. There, I found an inspiration board that, well, inspired me! I showed it to my fiancée, who loved the colours too! I thought the decision was made and I’d never had to re-consider the matter again. However, I was wrong. But I’ll get to that in a minute. The colour combo that initially excited me so much was aqua blue, orange and ivory. It was, in my mind, a “perfect palette” for a beach wedding, giving a bright, fun, summery feel- like we could pretend we were somewhere tropical. She suitably named this palette, ‘Island Wedding’. I didn’t know what to do, so I eventually evolved my colour scheme. I found another close relative, a cute alliterative couple in teal and tangerine. Do you see the problem? 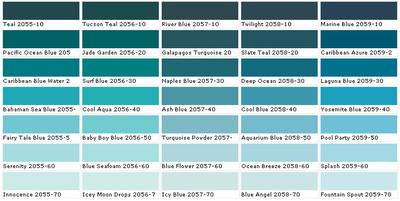 Teal, turquoise, aqua blue… are all pretty much the same colour. So unless I went all the way to jade, I was still left with a bridesmaid who did not want to wear my chosen colour. What to do? It was, somewhat literally, back to the drawing board. Soon after, however, I got worried that it was more of an autumn wedding colour scheme, and didn’t really go with my original beachy theme. So, I tried to bargain teal’s way back in, maybe in the organza table overlays, perhaps? Or in other decor elements? 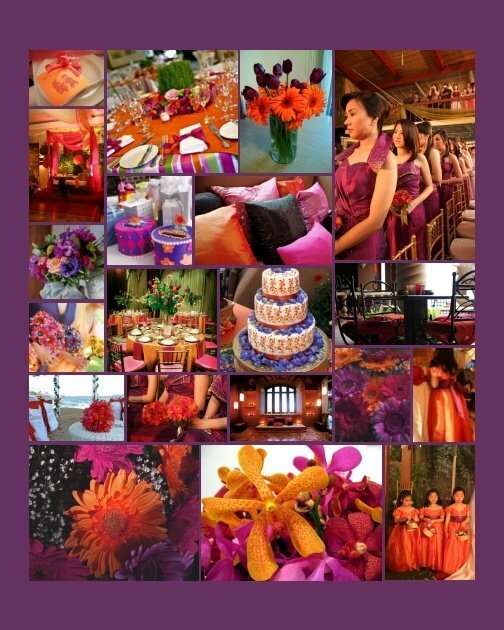 The wedding party can be in persimmon (dark orange) and plum (purple) but turquoise could highlight the venue? At this point I am considering purple, orange, teal, gold and ivory. How many colours are too many? What if my BMs don’t wear the same colour? What colour should we choose for the butch-maid vests, and what colour pants?? So many questions, and so many little details to stress over- if you let yourself. Picking a wedding colour scheme can easily become overwhelming. Eventually, both my fiancee and I had to take a step back and realize that we were going to a lot of trouble because ONE person didn’t want to wear a teal dress. Why was it such a big deal to us anyway? Isn’t it more important that our friends are happy to support us in this role, considering the money and time they will generously spend to be a part of our wedding? As I’ve written about before, I want to keep my friendships intact post-wedding. There’s no moral to this story, it’s just my story. My adventure in wedding colours! 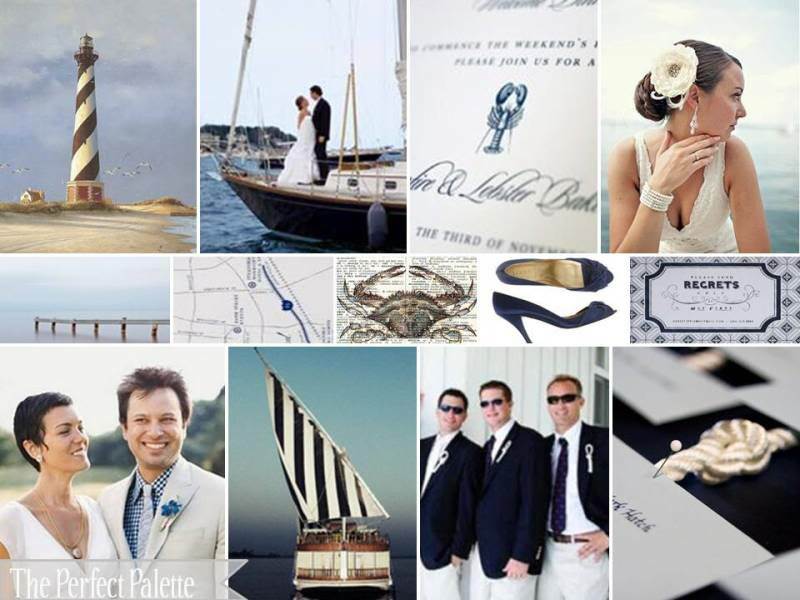 But since you’ve read this far, I’ll reward you with a few more lovely beach wedding colour schemes; inspiration boards again courtesy of The Perfect Palette. If you wanna see more pretty colours, I’ve started a Pinterest board of my favourite combinations. Have you picked your wedding colour scheme yet? Was it easy, and you never thought about it again? Or did you change your minds a few times? Yet another thing I didn’t know about planning a wedding is that picking a colour scheme is a crucial part of the process. Apparently, if you want a unified, semi-formal or formal look to your special day, everything should match within your “colour palette”. I’m talking about your bridal party’s dresses, the bouquets and larger floral arrangements, the decor, the invitations, even your signature drink. Sounded kind of intense to me. But I’ve been letting my imagination run wild for the past few weeks, and after discussing a number of options, my partner and I have settled on our colours. It’s beach and Island-inspired, so I think it will perfectly suit our oceanside wedding. 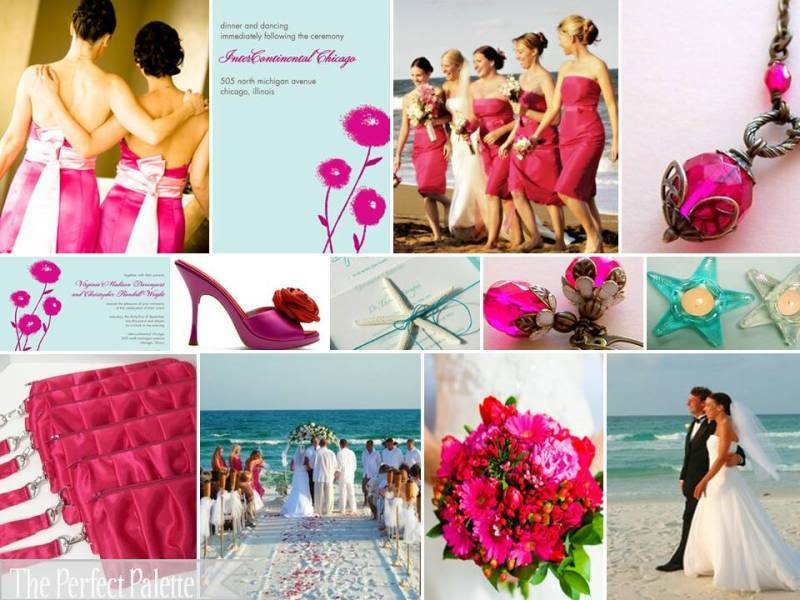 In my search I found this great blog site, dedicated to helping couples choose their wedding colours! The Perfect Palette. Her “Island Vibe” palette was just what I needed to make the final decision. 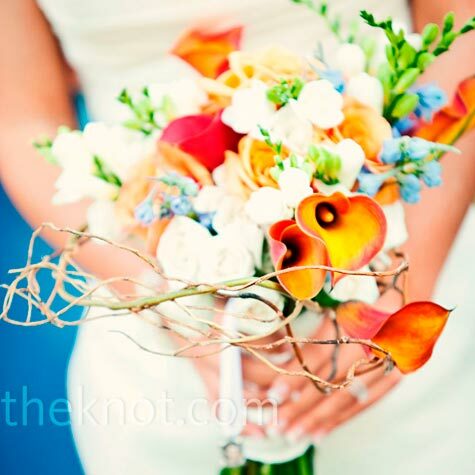 As well, theknot.com has TONS of photos to inspire you. 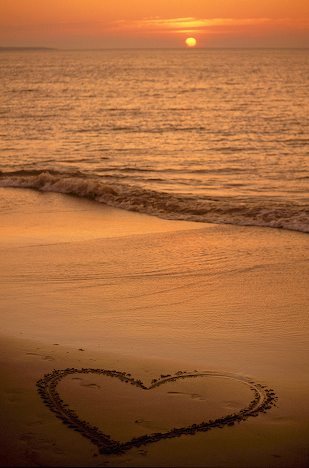 There’s something so romantic about the idea of getting married on a beach, isn’t there? I guess that’s why destination weddings to Hawaii and Mexico are so popular. Weather is more predictable than it is here on the wet coast! My partner really wanted a beach wedding. So I looked into a lot of different places, in the greater Vancouver area, the Sunshine Coast, and Vancouver Island. Do you see a pattern? Not many options in Vancouver. I didn’t even list all of the options on the Island! We toyed with the idea, but then decided we wanted to get married in Vancouver. It’s our home after all, and with family visiting from Ontario, we wanted to be able to show them the beautiful city that we live in. Initially we decided on Spanish Banks, and even submitted our application to the Parks Board. Then we checked out Ferguson Point in Stanley Park. Breathtaking views! And the Teahouse is right there! I inquired about a reception and quickly realized that we could only afford that if we made our guests pay for their own dinner. Then we discovered Celebration on Water. It’s not technically a beach location, but you’re right on the water. This big, beautiful boat; once in active service with BC Ferries; is in my opinion Vancouver’s most unique wedding venue. Probably one of the best kept secrets for West Coast brides-to-be too! But not for much longer, if I have anything to do about it. For couples like us who don’t want to have to fret over details, it is a wonderful all-included situation. We are taking about a gorgeous patio to have the ceremony on, a lovely formal dining room, in-house catering, and everything- tables, chairs, linens, cutlery, wireless mic, and even the bridal arch- is included in your price quote. The coordinator Michelene is simply a darling and we are so excited to be working with her for our ferry-tale wedding!